Environmentally Friendly 13 Gallon Garbage Bags. These super strong, 13 gallon trash bags are made from Post Recyclable plastic and will fully biodegrade in less than 200 days. This makes them an environmentally friendly choice because once they break down, there is nothing left but harmless bio-waste, water and a slow yield of CO2. Many times a product like this will require a compromise in quality in order to achieve the environmental benefits. 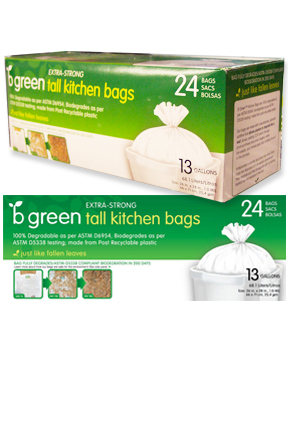 These biodegradable, kitchen-size trash bags from B Green are different. At 1.0 mil thick they are actually stronger and more reliable than most traditional versions. You will find that they hold up incredibly well, no matter what type or weight of waste you put in them, and will not begin degrading until way after you dispose of the full, used bag. No break down will ever take place on the shelf, in your cupboard, or in the can. Once introduced into the environment, under optimal conditions, the bag will begin degrading over time. In just 80 days it will be mostly broken apart, and much of it will appear to have disintegrated. In twice that time, the bag will be completely gone, and the material left behind will naturally mix with, and condition the soil. When you look at them, they look just like ordinary garbage bags, but an advanced additive allows them to biodegrade like no regular bag can. Normal plastic will be around for 100 years or more after you have tossed it, and it is not compostable at any time. When traditional bags eventually degrade, you are still left with harmful plastic waste chunks that can negatively affect wildlife and the environment. 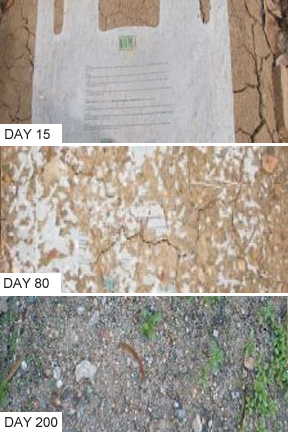 The time it takes for a B Green Biodegradable Trash Bag to degrade is measured in days, not years thanks to advanced materials, and the addition of Renatura. This Oxo-Biodegradable additive is the secret ingredient in these bags, and it is scientifically proven to be non toxic. In the presence of oxygen, a B Green bag will disappear over time when exposed to UV light or thermal heat thanks to this additive. This means that when you send your trash to the landfill, or place it in your compost, it will basically degrade in the same way that a fallen leaf does. As they disintegrate, these bags will slowly yield CO2 (which through photosynthesis becomes oxygen), water, bio-waste, and mineral salts that condition the soil. Do your part to reduce the amount of unsightly plastic that pollutes landscapes and waterways, and adds bulk to landfills. When you switch to B Green biodegradable trash bags in your kitchen, you can be sure that they will disappear over time, and never produce harmful effects on the environment. They are ideal for composting or going into a landfill. Because they break apart over time and allow trash to compact and decay more efficiently, they will increase the life span of the landfill, blend naturally with compost, and allow debris to break down quicker. They fragment in a short amount of time, so once in a landfill, compost or other dump location, the organic material contained inside your bag will be consumed by anaerobic bacteria to begin the natural decomposition process. A regular plastic sack would prevent the introduction of these microbes, thus preventing this process from taking place. These eco friendly bags allow you to have a smaller overall impact on the environment and the piece of mind that comes from knowing that the trash you throw away will biodegrade and break down much quicker and more efficiently than normal. These sturdy trash bags are a standard, thirteen gallon kitchen size, and will fit virtually any kitchen sized garbage can. They are perfect for collecting food waste, paper goods and other compostable material, but can also be used effectively for any kind of trash you have. Because they are super thick, you don't have to worry about these leaking or falling apart when in use like other bio bags on the market. They are also ideal for yard cleanup, gardening and collecting other outdoor waste. When completely filled with biodegradable waste, you can be sure that everything you are tossing will break down over time. This is a benefit that you can't get with a traditional plastic bag, and some communities will even have specific pick ups for this kind of trash. Rest assured that these trash bags are as stable on the shelf as any other paper product, and will store perfectly for a long time. You need to actually expose them to the oxygen, UV rays, heat and the microorganisms that come with throwing them away to begin the degradation process. When left in the box, they can almost last forever. 24 bags/box. Order Yours Today! Box Dimensions (l x w) 8" x 3.25" x 3.25"
Bag Dimensions 26" x 28"
Biodegradable, Tall Kitchen Trash Bags - Choose an environmentally friendly garbage bag. These are tall kitchen size, and are a viable green alternative to traditional versions because they are sturdy, yet 100% biodegradable. Order Yours Today! My wife complains that they aren't strong enough and she's going to get some stronger ones which probably won't be biodegradable but nor will they leak. There is absolutely NO indication on the bags to show our trash collectors, or anyone else for that matter, that they are recyclable. What a shame! Our collectors will not accept them as recyclable...lots of money spent for naught! simplygoodstuff response: We are sorry to hear of your disappointment. These bags are intended to go into landfills and then biodegrade. Other recyclable plastic bags would have markings like you expected. These are still eco-friendly, but not quite what you had in mind based upon your reaction. I was so thrilled when I found these bags. Most bio kitchen bags are not strong enough. I rest easy in that all my biodegradable but not recyclable items are decomposing instead of being trapped in a conventional bag. Feel better about your garbage! 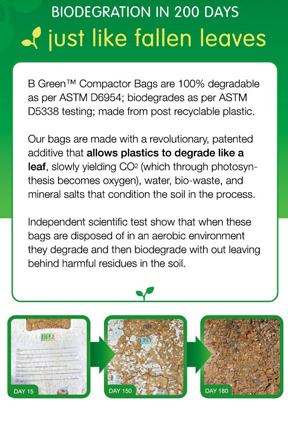 These biodegradable bags are just as strong, if not stronger, than the ones clogging up our landfills. A little less plastic goes a long way! These bags are the smartest thing you can buy to help the environment. A mere 200 day breakdown is awesome. I have used them for a couple months now and they are just like any other garbage bag. They are strong and flexible. What is the name of the additive used to make your bags biodegradable?